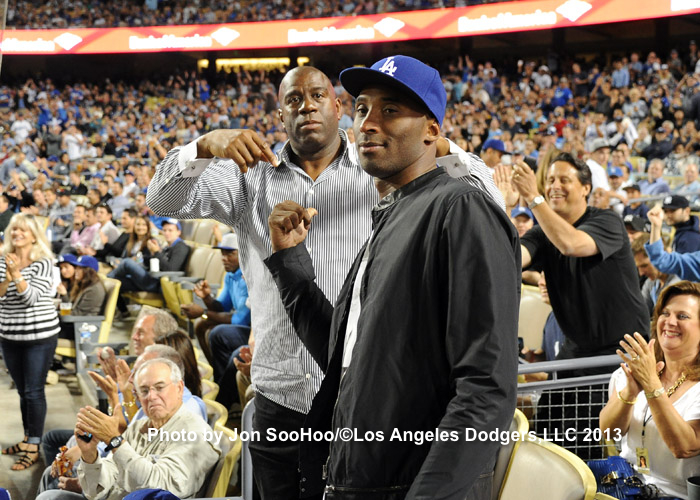 Who was the Dodgers’ Kobe? It’s hard to be a sports fan in Los Angeles and not be affected by the end of Kobe Bryant’s career. Twenty seasons in a Los Angeles uniform? For one attempt at perspective, here’s the Dodger starting lineup on June 26, 1996, the day the 17-year-old Bryant was drafted. Candiotti, the starting pitcher that day, is now 58 years old. 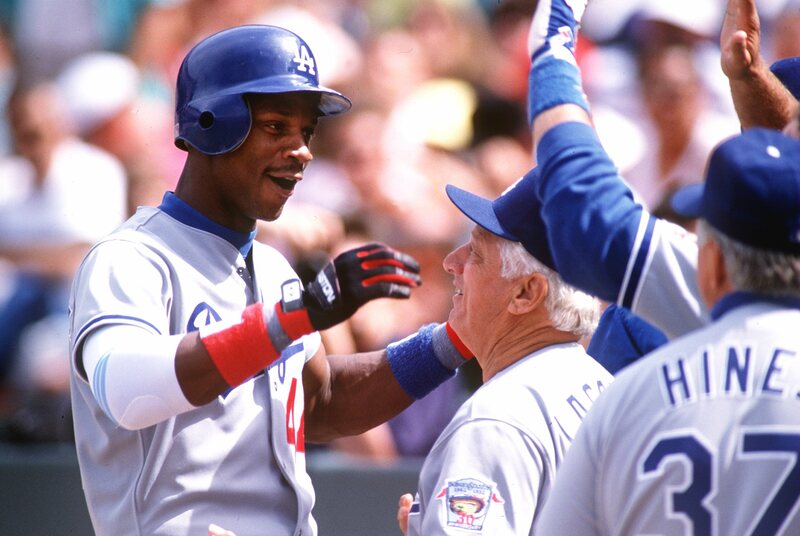 On the way to work this morning, I asked myself who would be the Dodgers’ closest equivalent to Bryant, a spectacular, championship-winning (future) Hall of Famer who wore only one team’s uniform (albeit with two numbers). It won’t surprise you that there’s no exact match, but I do think there’s a closer one than you might realize. 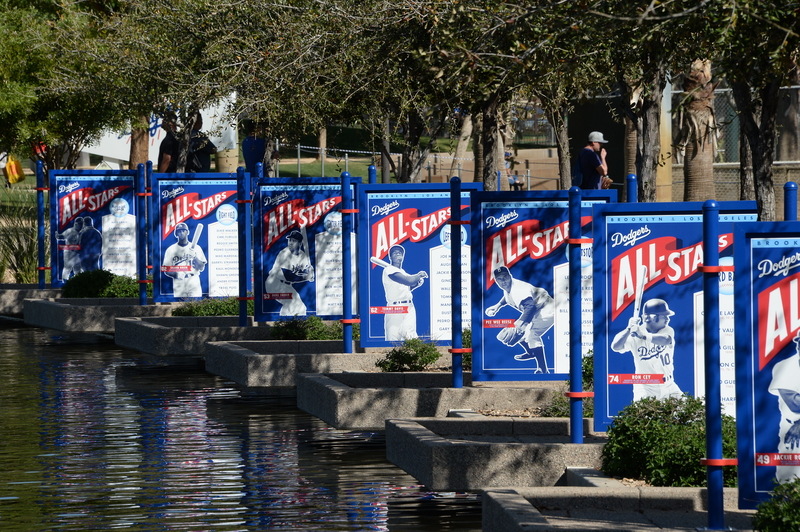 You can now purchase tickets for individual Dodger Spring Training games taking place at Camelback Ranch in 2016. And from now until December 6, you can save $3 per seat by entering the code “TEAM” when you click here and purchase. For more information, visit dodgers.com/spring. 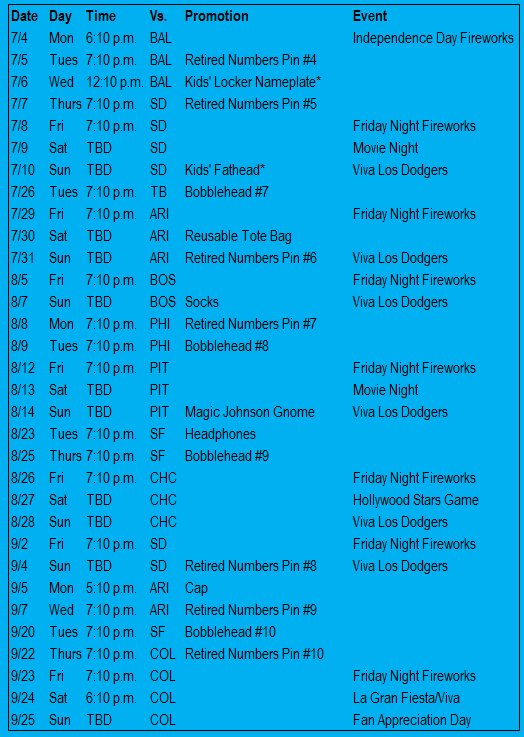 Previously: Dodgers unveil 2016 Spring Training schedule. 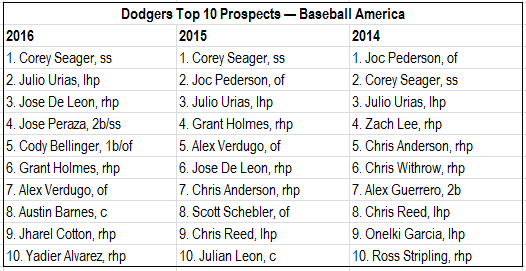 Baseball America’s annual ranking of Dodger prospects actually comes early this year — the 2015 rankings were published 10 months ago — and comes with five names that weren’t on the preseason 2015 list. Joc Pederson graduated from prospect status, but Corey Seager remains a rookie despite his impressive September debut, allowing the Dodger infielder a second consecutive year in the No. 1 slot. Julio Urias moves up a spot accordingly to No. 2, while right-hadner Jose De Leon leapfrogs into the No. 3 spot. The top newcomer on this year’s list is infielder Jose Peraza, acquired from Atlanta in the big July 30 deal. “Peraza lacks a high ceiling,” Baseball America’s Ben Badler writes, “but his bat-to-ball skills and wheels should make him a steady player in the middle of the diamond.” In the list of best tools in the Dodger minor leagues, Peraza is called the organization’s top athlete. Making the biggest leap internally is first baseman-outfielder Cody Bellinger, who skipped Great Lakes after hitting three homers with Rookie League Ogden in 2014 and hit 30 for High-A Rancho Cucamonga in 2015. 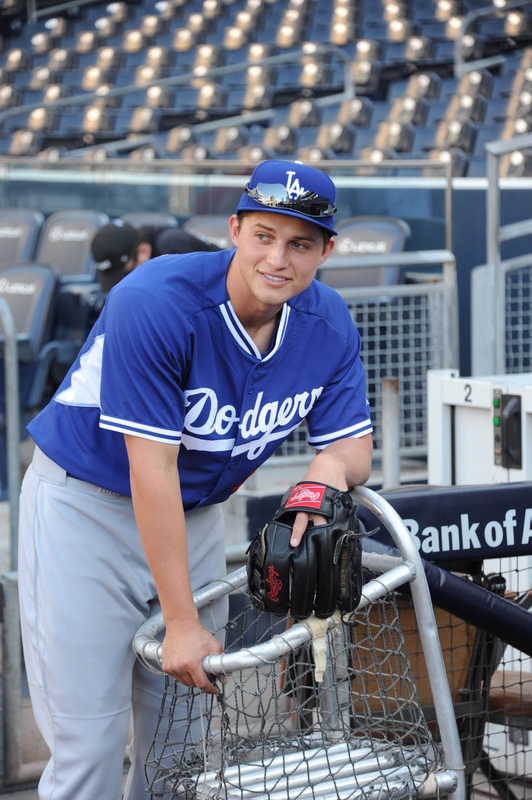 The 20-year-old is also labeled the best power hitter in the system. Welcome to Dave Roberts’ honeymoon with Dodger fans and the media. The new Dodger manager hasn’t been asked a question, hasn’t made a move. His rose is in full bloom. But it takes two to be happy in a marriage, and let’s just say that Roberts’ collective new spouse — after 27 years of frustration — can be a bit challenging to keep satisfied. Maybe it’s a song or a movie or something else. You’re in the moment and it sort of comes and goes. And then it comes around again, for one reason or another, and you realize that maybe you missed something special the first time around. 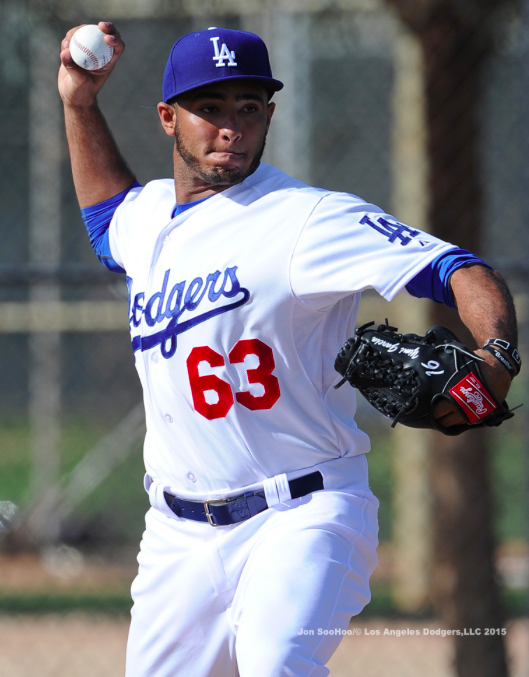 It’s not too late to appreciate the kind of season Yimi Garcia had. Would you be surprised if I told you he was arguably one of the 30 best relief pitchers in Major League Baseball in 2015? Certainly it’s at the tail of the top 30, but Garcia’s numbers make for a reasonable argument. Every once in a while, November gets loud in L.A.
That’s November for you. The stove doesn’t tend to warm up until the annual Winter Meetings in December. Historically speaking, in the era of the million-dollar free agent that began in 1980, the Dodgers have made mostly quiet moves in November. For example, in November 2014, the Dodgers acquired two bullpen arms — Adam Liberatore and Joel Peralta — from Tampa Bay and purchased Mike Bolsinger from Arizona. However, there have been some earth shakers in the past, as well as transactions that helped shape the ball club for years to come. Happy Thanksgiving, everyone. In the spirit of the day, here’s someone to be thankful for: Clayton Kershaw. It’s well established that Kershaw is a rarity. What has helped him to achieve that status is the fact that he limits offenses not only in runs allowed, but in many other categories. You have a better chance of winning at a Las Vegas slot machine than of seeing Kershaw allowing some fairly common events to happen on his watch. There’s this long-standing narrative in baseball about a rookie manager having to earn his stripes or needing some sort of prior big league managerial experience before he can guide a team to a World Series or even bigger, a World Series title. Justin Turner and the Dodgers will kick off the holiday shopping season with a Blue Friday sale and autographs at the Top of the Park store, the day after Thanksgiving. Fans will enjoy up to 30 percent off merchandise, with Dodger Pride rewards card members also receiving an additional discount. 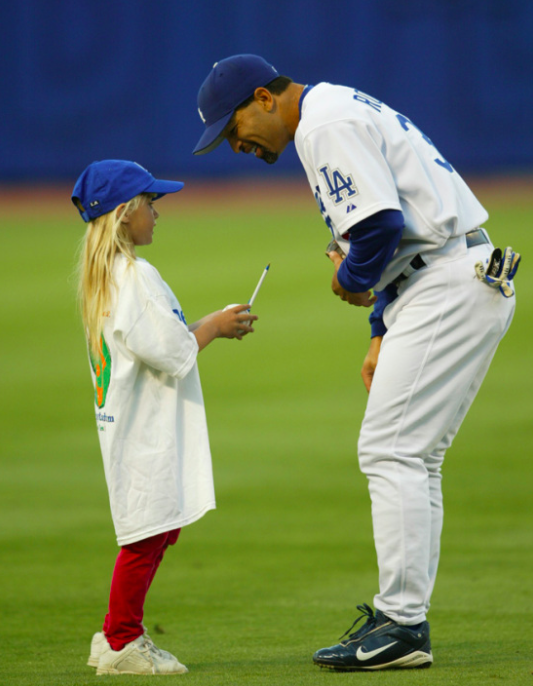 In addition, the Dodgers’ ticket sales staff will be on hand to sign fans up for 2016 mini plans, which include opportunities to get tickets for the just-announced promotional dates. If a Justin Turner Chia Pet and a Vin Scully T-shirt don’t sound like two of the greatest promotions ever, I might be speaking to the wrong crowd. 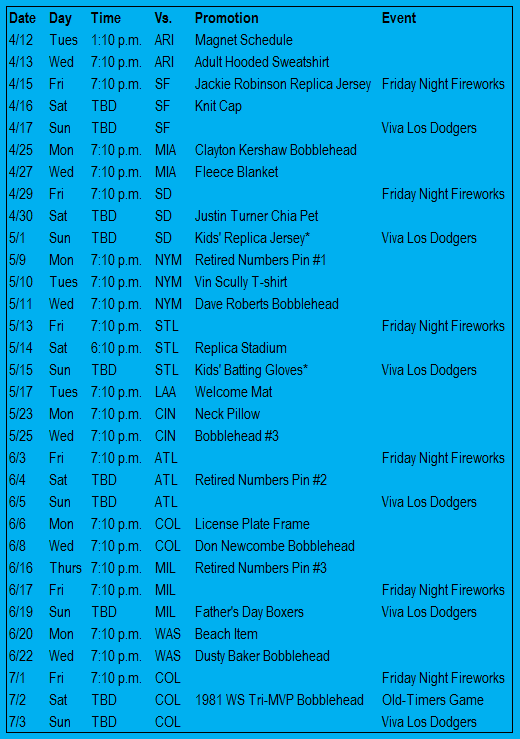 But for the right-thinking people among you, this April 30 giveaway is one of many highlights of the Dodgers’ 2016 preliminary promotion schedule. New giveaways for next year also include a neck pillow, license plate frame, Father’s Day Dodger boxers, kids’ locker nameplate and socks. New manager Dave Roberts, Don Newcombe, Dusty Baker and Clayton Kershaw will be among 2016’s 10 bobbleheads, along with one saluting 1981 World Series tri-Most Valuable Players Ron Cey, Pedro Guerrero and Steve Yeager. In addition, the 10-date Collectors Pin Series will spotlight on the Dodgers’ 10 retired numbers, and Magic Johnson takes over for Tommy Lasorda as this year’s giveaway gnome. 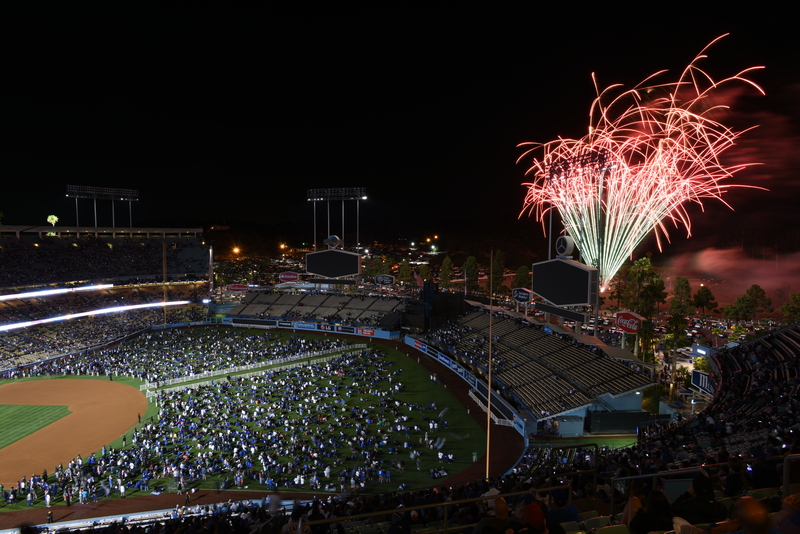 The Dodgers are also announcing two new mini-plan options for 2016 with tickets starting at $19 per game. A preset 21-game Collectors Plan offers Opening Day, all 10 bobblehead giveaways, all 10 retired number collectible pins and Jackie Robinson Day. A 30-game Flex Plan allows for any 2016 home game, including Opening Day. All mini plans are on sale now at dodgers.com/miniplans. Giveaways are limited to 40,000 units per game, unless otherwise noted. Kids giveaways are for the first 15,000 ticketed kids 14 & under in attendance. Only one giveaway item per person will be given to the bearer of the ticket upon entering the stadium.